OR7, the wolf who journeyed from northeast Oregon to California, found a mate and has just sired these three puppies. They're the first born anywhere near California in at least 100 years and these are the first pictures of them. OR7 (pictured above) first garnered national headlines when he left his pack in northeast Oregon on September 10, 2011 and ventured south by himself, embarking on a journey that would last over 2,000 miles and three years, crossing four major highways in the process. The trip made him the first free-roaming wolf to enter western Oregon since 1947, when the last of his species was killed there. It also made him the first free-roaming wolf to enter all of California since 1924. OR7's mate is black, as is one of the pups. Observers expected that he was searching for a mate, but moving through an area which hadn't seen any wolves in 60 years or more had people doubting his chances. He spent two years wandering the California/Oregon border alone then, in May of this year, a wildlife camera in the Rogue River Valley spotted him traveling with a hitherto unknown female. No one knows where she came from, but speculation began to run rampant that the pair had mated. A filmmaker in Oregon has even produced a documentary about OR7. 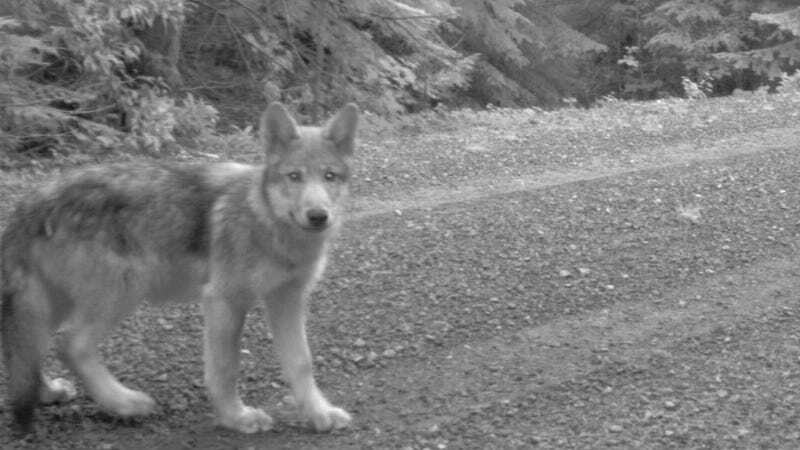 Then, on June 2, biologists spotted these three wolf puppies. They're the first born in region in at least 100 years. Understandably, their exact location isn't being released, but being located in the Cascades, so close to the California border, makes it likely that, should this brand new pack succeed, its members could disperse into the state. Reacting to the news, the California Fish and Game commission voted to protect the family under the state's Endangered Species Act. OR7's GPS tracking collar — nearly out of battery — will be replaced in the near future and efforts will be made to maximize the wolves' chance of survival. These photos, taken on July 12, are the first and only captured of OR7's new family. "They look like they're doing well, as far as we can tell from the photos," John Stephenson, a US Fish and Wildlife Service biologist who's studying the family told The Sacramento Bee. "The pups are getting big enough now to where they're mobile. They've left the area where they originally denned in April and May and they're going to rendezvous sites, as we call them, where the pups stay while the adults go out and get food for them. It seems like things are going along good."